Dark sea slick, silence… when suddenly mysterious green glow from the depth extends the darkness to shock the public on the shore. That’s how Mosquito Bay greets those striving for magic and beauty. 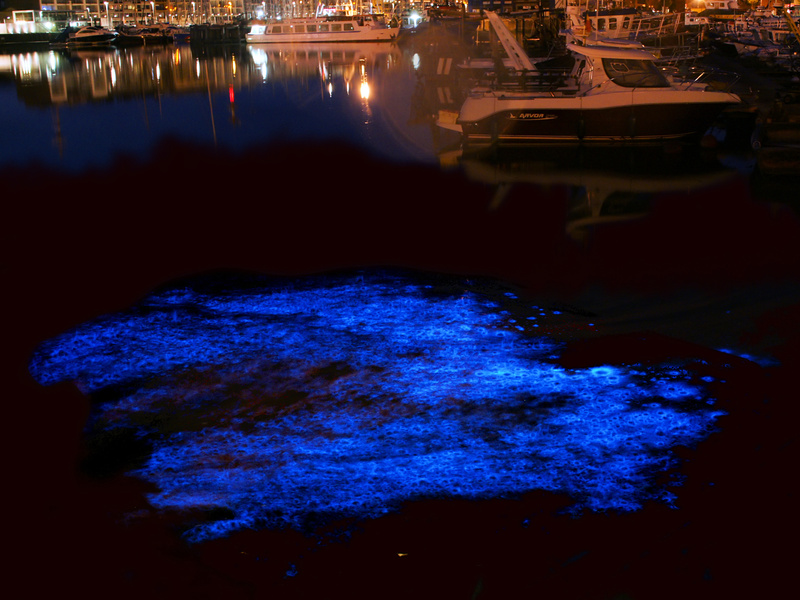 Luminous miracles are created by its inhabitants, microscopic organisms dinoflagellates. In order to turn on the illumination it is enough to disturb the perfect calmness of the water since the bacteria start “blinking” on a slightest impact upon them. Flashes can be distinguished from as far as a couple of kilometers although they last for less than a second. Concentrations of these fireflies is so high that so far here remains a possibility to push ‘on’ by sending a stone jumping along the water or have a plunge by yourself. The bay used to be a worshiping object for locals. Not understanding the reasons for sudden sea “inflammation” after dawn, they decided that water gods established their Olympus there. In the daytime people used to come to the shore to thank them for given nutrition in the shape of variety of seafood. In the night they used to honor and glorify the green light that served as illumination for onshore settlements and a waymark for lost wanderers. Nowadays no one believes in this kind of “higher powers” but the bay still remains a daily breader generating revenue from touristic visits. Despite the fact that before dawn the glow is invisible in clean turquoise water, the majority of places at the beach will be taken anyway. Mangroves surrounding the bay help holiday-makers to distance from fussy world and join in the beauty of unique nature here. Pelicans tracking down fish whirl above the water and when they see the bag – they plunge into the sea causing water to splash and tourists to burst out in admiration. Not waiting for the dawn and “lighting effects” the visitors dive into warm and clear water. Here shoals of variegated fish resembling multicolored bowl ones, await tourists, swim close to the shore and tickle them by their swimwear. Old-timers say that there is a mere one tenth of the former bay glow left. Previously many shining seas could have been found in the waters of the Caribbean. But due to development and population of the coastline as well as environment deterioration the majority of them are lost forever. Armies of water mchines like holiday cruisers and wet bikes invaded a part of Mosquito Bay. Adverse effect on microorganisms is also exerted by creams, deodorants and cosmetics that those willing to dip and flare surrounded by billions of tiny lights bring on themselves. 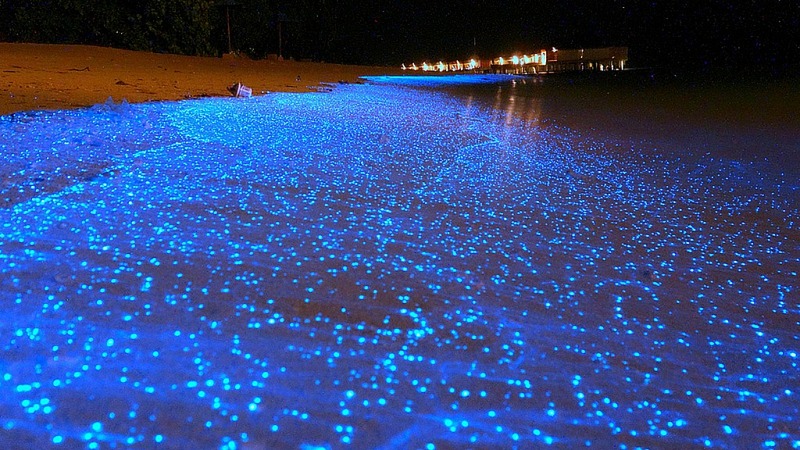 Those who want to manage and see an extraordinary bioluminescent bay on their own, should put their best forward. It is well possible that soon, on top of American visa, they’ll have to be getting a special permit for the visit. Puerto Rico authorities repeatedly bring up the issue of introducing such measures (but final decision isn’t yet made) in order to preserve exotic effects and primeval beauty of the place.